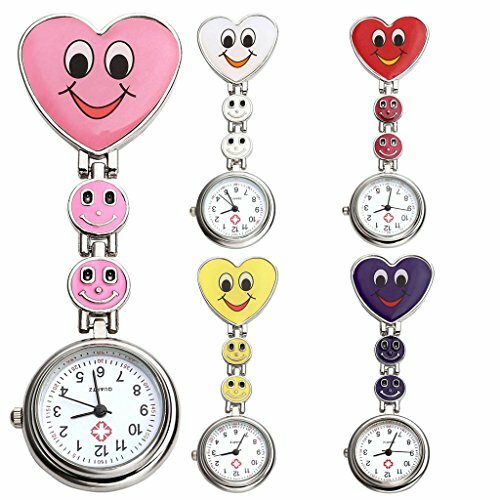 Cute and colorful smily face nurse fob pocket watches for doctors, nurses or other people who works in the hospital or any medical occasions. Wholesale 5 pcs pocket watches with very affordable price. Color: White, Pink, Purple,Red, Yellow. 90 days 100% Money Back Guaranteed.If you are not completely satisfied with the product within 90 days after received it, you can ask for return or replacement. But absolutely no risk. Clip on fob watch for nurses and doctors. Fun design brighten up your day with your patients in hospital. Clip on design, you could clip it on your clothes or wherever you likr. Not waterproof, please don't get in touch with water. Package: 5 nurse watches, 1 Top Plaza Gift Bag, 1 watch box.